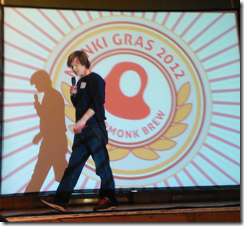 I attended The Monki Gras in London yesterday, a distinctive developer event arranged by the analyst firm RedMonk. This was not only a developer event, with the likes of Andre Charland and Dave Johnson from the PhoneGap team at Adobe, Mike Milinkovich the executive director of the Eclipse Foundation, and Jason Hoffman with Bryan Cantrill from cloud services (and Node.js sponsors) Joyent. 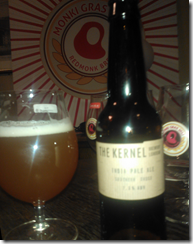 It was also a serious beer event, complete with a range of craft beers, a beer tasting competition with nine brews to try, and a talk plus a free book from beer expert Melissa Cole. An unusual blend of flavours. In charge of the proceedings was RedMonk co-founder and all round impressario James Governor. I am a big fan of RedMonk and its developer-focused approach; it has been a fresh and heady brew in the dry world of IT analysts. 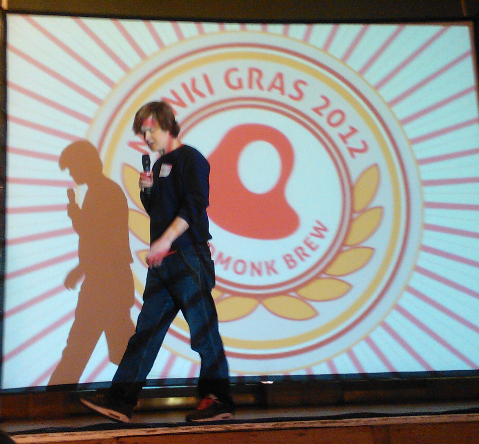 The Monki Gras did seem like an attempt by a regular IT conference sufferer to fix problems often encountered. The Wi-Fi worked, the food was fresh, unusual and delicious, the coffee was superb; though brewing good coffee takes time so the queues were long. Not everything scales. Fortunately this was a small event, and a rare treat for the couple of hundred or so who attended. That said, there were frustrations. The sessions were short, which in general is a good thing, but left me wanting more depth and more details in some cases; we did not learn much about PhoneGap other than a brief overview, for example. Nevertheless there was serious content. Redmonk’s Stephen O’Grady made the point succinctly: IT decision makers are ignorant about what developers actually use and what they want to use, which is one reason why there is so much dysfunction in this industry. Part of the answer is to pay more attention, and several sessions covered different aspects of analytics: Matt LeMay from bitly on what users click on the Web; Matt Biddulph (ex BBC, Dopplr, Nokia) gave a mind-stretching talk on social network analysis which, contrary to what some think, was not invented by Facebook but predates the Internet; and O’Grady shared some insights from developer analytics at RedMonk. I had not noticed before that github now gets nearly double the number of commits than does Google Code. That is partly because developers like git, but may also say something about Google’s loss of kudos in the open source developer community. Something I see frequently is how big companies (the bigger the worse) place obstacles in front of developers or users who have an interest in their products or services. Examples are enforced registration, multiple clicks through several complex pages to get to the download you want, complex installs, and confusing information. It all adds friction. If the target is sufficiently compelling, like apps on Apple’s app store, developers will get there anyway; but it all adds friction, and if you are not Apple that can be fatal. The Joyent guys did not speak about Node.js, sadly, but rather on the distinction between a VP of engineering and a Chief Technology Officer. Sounds dry and abstruse? I thought so too, but the delivery was so energetic that they were soon forgiven. Hoffman and Cantrill moved on to talk about management antipatterns in the software industry, prompting many wry nods of recognition from the audience. “It is very hard for middle management to add value,” said Cantrill. Milinkovich made the point that the most valued open source projects generally make their way to a software foundation; PhoneGap to Apache is a recent example. He then gave the talk he really wanted to give, noting that as new software stacks emerge they have a tendency to re-implement CORBA, a middleware specification from the Nineties that tackled problems including remote objects, language independence, and transactions across the Internet. CORBA is remembered for drowning in complexity, but Milinkovich’s point is that the creators of exciting new stacks like Node.js should at least research and learn from past experience. Milinkovich also found time to proclaim that “Flash is dead, Silverlight is dead, browser plugins are dead.” Perhaps premature; but I did not hear many dissenting voices. I tweeted the conference extensively yesterday (losing at least one follower but gaining several more). Look out also for a couple of follow-up posts on topics of particular importance.